FREE APPRAISAL. If you are looking to auction, authenticate, buy, consign or sell original film used Aliens Memorabilia, please email Nate@NateDSanders.com or call the Nate D. Sanders Auction House office (http://www.NateDSanders.com) at (310) 440-2982. Aliens memorabilia can sell for $100,000 or more. Original rifles and costumes used and worn by the main stars such as Sigourney Weaver or Bill Paxton can be worth a fortune. 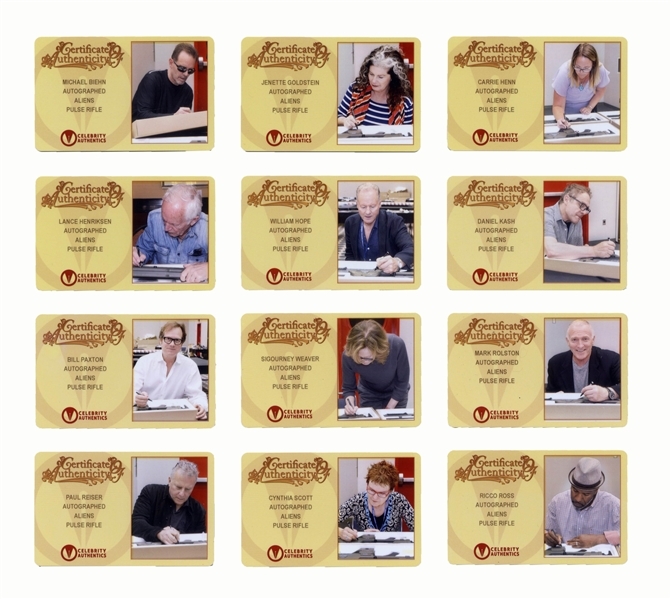 We at Nate D. Sanders Auctions have sold various pieces of film memorabilia for hundreds of thousands of dollars each and we look forward to hearing what you have. Scarce model from the 1979 film “Alien” of the famed “Space Jockey” character aboard the “derelict spaceship”, designed and hand-painted by H.R. Giger. One of the most recognizable scenes in sci-fi cinema, the haunting Space Jockey aka The Pilot, found dead aboard the alien spaceship, was conceived and designed by famed Swiss surrealist painter, sculptor and visual effects artist H.R. Giger, whose work on “Alien” won an Academy Award in 1980. (Aliens Memorabilia or Alien Memorabilia). Reserve $100,00. Aliens Memorabilia. Click above for larger image. M41A Pulse Rifle, a replica of the weapon used aboard the Sulaco spaceship in James Cameron’s 1986 “Aliens”. 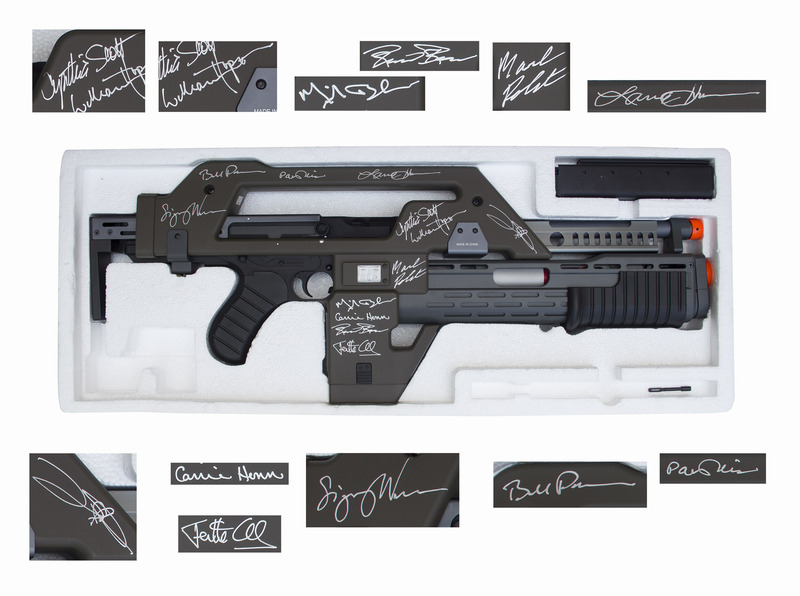 Rifle is signed in silver metallic ink by Sigourney Weaver (Ripley), the late Bill Paxton (Hudson), Lance Henriksen (Bishop), Paul Reiser (Burke), William Hope (Gorman), Michael Biehn (Hicks), Carrie Henn (Newt), Ricco Ross (Frost), Daniel Kash (Spunkmeyer), Cynthia Scott (Dietrich), Jenette Goldstein (Vasquez) and Mark Rolston (Drake). Rifle is 1:1 scale of the original, measuring 27″ x 11″. Weighs 7 lbs., 14 oz. Features a functional LCD round counter that counts down from 95. With COAs for each signature from Celebrity Authentics. 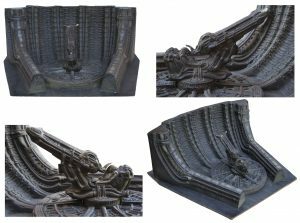 Great Aliens memorabilia. Reserve $3,250. Please let us know if you have Memorabilia from the movie Aliens. Top dollar obtained for your Aliens Memorabilia.